Lumidigm has introduced the compact Venus Series fingerprint sensors which they hope eliminates previous issues with similar sensors such as failure to enroll, high false reject rates and poor performance in outdoor environments. Venus Series returns high-quality images regardless of how wet or dry a person’s finger is or what the environmental issues are (rainy, sunny, dry, dirty). Multispectral images are captured by using multiple wavelengths of light to look below the skin surface. The Venus Series is equipped with both USB and serial communication interfaces, which make integration into existing systems easy. Albuquerque, NM — Lumidigm Inc., the creator of multispectral imaging biometrics, has introduced the Venus Series. This product line of exceptionally reliable fingerprint sensors virtually eliminates the common performance problems experienced when using conventional fingerprint sensors such as failure to enroll, high false reject rates and poor performance in outdoor environments. The Venus Series fingerprint sensors return superior images on virtually anyone, anytime, in any environment. Armed with Lumidigm’s patented multispectral imaging technology, Venus provides clean, clear results regardless of how wet or dry a person’s finger is or what pressure is applied. Fingerprint images are captured—even when the individual has little or no surface fingerprint—by using multiple wavelengths of light to look deep below the skin surface at the identical internal fingerprint. These high-quality multispectral images reduce or eliminate enrollment problems and false rejections. The result is increased user satisfaction and reduced costs. Fake fingers and fingerprint spoofs are a significant risk for conventional fingerprint sensors. The Venus Series sensors eliminate this barrier to deployment. Readily available spoofs that easily defeat conventional fingerprint sensors such as thin films and prostheses are rendered useless against Lumidigm’s new sensor. The compact Venus Series sensors are one tenth the size and a fraction of the cost of previous designs. 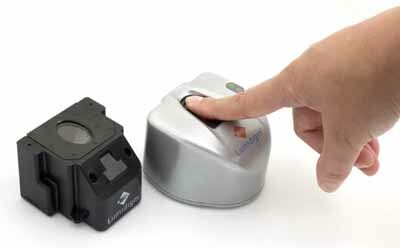 The rugged optical units return high-quality, 500 dpi fingerprint images in any environment. Rainy, snowy, sunny, dry, and dirty environments all are easily handled by the technology. To meet any application requirement, the Venus Series has flexible output options: fingerprint image, ANSI 378 compliant template, or match score. The Venus Series is equipped with both USB and serial communication interfaces, which make integration into existing systems easy. Two form factors are currently available. The Venus Series OEM Module is the perfect choice for system, reader, or kiosk manufacturers who wish to embed this powerful technology into their hardware systems. Alternatively, the Venus Series Fingerprint Sensor is a stylish “end-user ready” product suitable for desktop deployment by system integrators and software application providers. Development kits are available that include a Venus Series sensor, software development kit and integration documentation for both PC and embedded applications.